Recently TCS, an Indian IT company, was included in the list of global top 10 IT services firms. This was a huge moment of all Indians, as never before any Indian company has made to this exclusive list. This signifies the aura of IT specialty which India has earned over the years. But despite such greatness in providing cutting edge IT solutions to world superpowers, our domestic Internet connection speed is dismal to say the least. In a just released “State of the Internet” report by Akamai, it was revealed that India is ranked at #123 globally in terms of average Internet connection speed. Compared to last quarter, this is a marginal improvement of 4.4%. 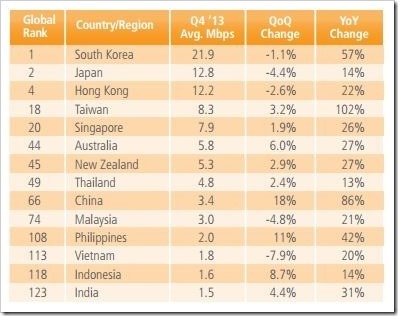 Within Asia region, Korea tops this list with 21 MBPS average Internet connection speed, which actually puts us at shame as we have managed to pull in paltry 1.5 MBPS speed as an average during 2013. Even smaller countries like Hong Kong, Taiwan, Thailand and Vietnam has faster internet connection than India! In terms of high broadband adaptation, we are ranked at #54 with just 0.4% Indians having access to such ‘luxury’. Countries like Korea (71%); Japan (47%) etc are much ahead of us in this department. Although compared to last year, we have improved 131%, but still, the current percentage can’t be termed as even below average. The good thing is that, we are aware of our infrastructural challenges, and we are quite vocal about this as well. Large scale condemnation and complains about low Internet speed has prompted TRAI to enter the picture, and improve the state. TRAI has recently released a report titled, “Amendment to the Standards of Quality of Service for Wireless Data Services Regulations, 2012” which mandates all telecom companies to publish the minimum internet speed which their consumers will receive under all circumstances, along with the prices and plan features. Further, TRAI has asked all Indians to input their suggestions and set a minimum wireless Internet speed which every telecom company must adhere to. They have started with improving wireless Internet connection (Data cards, mobile internet) but will soon venture into broadband and wired Internet as well. TRAI has noted that telecom companies promise high internet connections, but the actual results are quite below average. Most often, consumers are not aware of the either the promised speed or the speed they are receiving, and continue to pay their dues. They want to change that. TRAI has said that they are observing the average internet speed as reported by telecom companies, and found that there is a huge gap between minimum and maximum speeds, which ranges from 21 KBPS to 98 KBPS for 2G! It seems consumers are taken for a ride here. TRAI has asked all Indians to send in their suggestions and ideas latest by May 5, 2014 at this email id: [email protected]. Counter comments can be sent by May 12, 2014. Don’t miss this opportunity to improve and upgrade Indian internet speed!